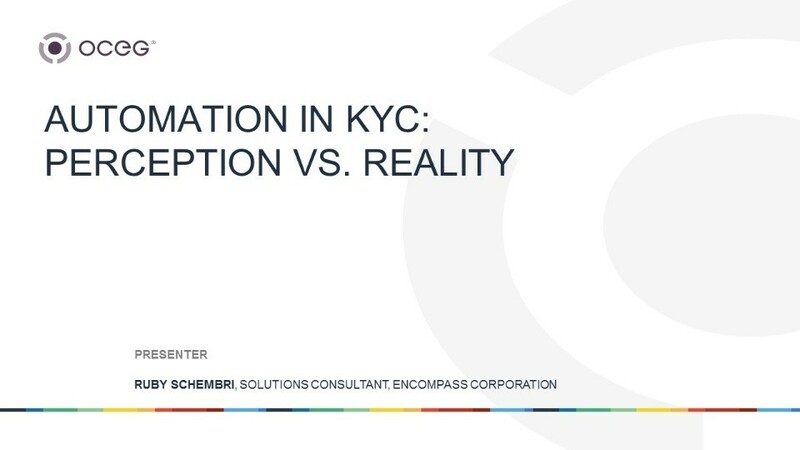 In this complimentary webinar, CAMS-certified solutions consultant Ruby Schembri will update you on the current progress of automation in KYC and developments to be made in the future. With their promise of accelerating digital transformation, cutting costs and increasing revenues, technologies including intelligent automation, robotic processing, artificial intelligence and distributed ledger are on business leaders’ radars. Within banking and finance, companies ranging from startups to tech giants are promising a digital revolution for Anti-Money Laundering (AML) professionals responsible for onboarding and Know Your Customer (KYC). But what exactly is automation and intelligent processing, and do these new technologies really deliver on their promise? Just how smart is intelligent processing? What are the returns on investment from this new technology? Discuss commonly-held perceptions of automation in banking and finance - guiding truths or impediments to progress? Discuss robotic processing and artificial intelligence - vendor hype or foundations for new digital processes?